The human skull (latin: cranium) is the skeleton of the head composed of 22 bones, most of which are paired. The main function of the skull is to provide protection for the brain and the sensory organs connected with it. The skull also incorporates the upper parts of the digestive (mouth) and respiratory tracts (nose), and supports the soft tissue of the head. The human skull consists of two main parts - the neurocranium and the viscerocranium. The neurocranium encloses the brain and sensory organs connected with it, and it can be further divided into a cranial vault and a cranial base. The viscerocranium is the part situated anteriorly from the neurocranium that forms the facial skeleton. The skull may also be divided into a calvarium that is robust and surrounds and protects the brain and a facial skeleton that is more delicate, composed mostly of thin-walled bones, some of which house air-filled cavities known as the paranasal sinuses. The neurocranium consists of bones of the skull that are in contact with the brain. There are eight bones forming the neurocranium. These are four single bones (sphenoid, occipital, frontal, ethmoid) and two paired bones (temporal, parietal bones). The viscerocranium (or splanchnocranium) is composed of the facial bones of the skull. Six of them are paired (maxilla, zygomatic bone, palatine bone, lacrimal bone, nasal bone, inferior nasal concha) and three are unpaired bones (vomer, mandible and hyoid bone). There are also three tiny bones, the auditory ossicles (malleus, incus and stapes), located within each middle ear, which is housed in the skull, specifically, within the right and left temporal bones. The bones of the skull are connected to each other with the help of fibrous junctions called sutures. The bones of the skull grow and fuse together during fetal and childhood development, forming a single skull. However, the mandible remains separate from the rest of the skull. There are around 33 sutures in the human skull. The most important sutures in the skull are the coronal suture, sagittal and lambdoid sutures. The coronal suture lies between the frontal and the two parietal bones, the sagittal is the median suture situated between the right and left parietal bones, and the lambdoidal suture lies between the occipital and the two parietal bones. There is only one synovial joint between bones of the skull. It is the temporomandibular joint (TMJ), which is formed between the head of the mandible and the mandibular fossa of the temporal bone. The movements permitted by the TMJ include depression and elevation of the lower jaw, moving the jaw forward and backward, side to side, as well as rotating movements, for example, for chewing. 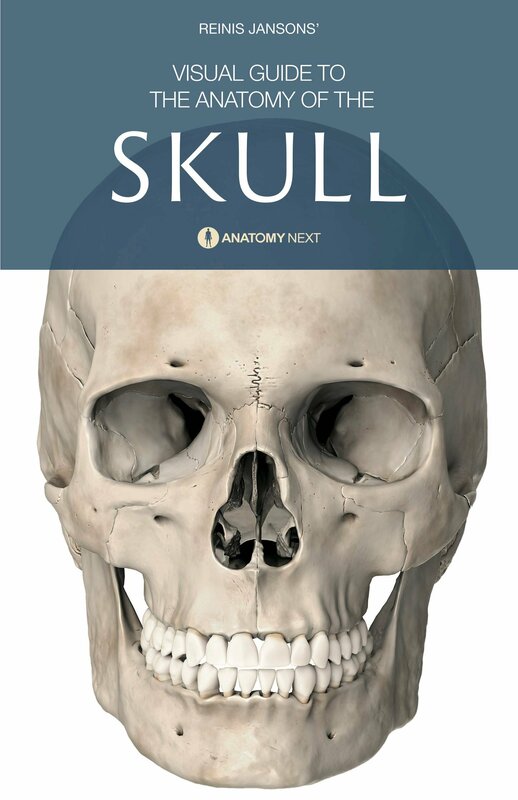 The skull is rich with openings, including foramina and canals, that serve mostly as passages for cranial nerves, their branches and accompanying blood vessels. Nerves and vessels form neurovascular bundles, which may be harmed at the sites of skull openings by pathological process or trauma. The largest opening of the skull is the foramen magnum in the cranial base, through which the spinal cord as an extension of the medulla oblongata exits the cranial cavity. The foramen magnum is a single opening, while most of the foramina of the skull are two (bilateral) and some are multiple in number, for example, the foramina of the cribriform plate. Listed below are the most important openings of the skull with the parts of the skull they connect and the structures they carry. Supraorbital foramen (or notch): located in frontal bone, connects cranial cavity with forehead region on external face, transmits supraorbital nerve, artery and vein. Foramen cecum: located in frontal bone, connects cranial cavity with nose region, transmits an emissary vein from the nose to the superior sagittal sinus. Foramina of cribriform plate: in ethmoid bone, connects nasal cavity with anterior cranial fossa, transmits bundles of olfactory nerves (CN I). Anterior ethmoidal foramen: in ethmoid bone, connects anterior cranial fossa with orbit, transmits anterior ethmoid nerve, artery and vein. Posterior ethmoidal foramen: in ethmoid bone, connects orbit with nasal cavity, transmits posterior ethmoidal nerve, artery and vein. Optic canal: in sphenoid bone, connects middle cranial fossa with orbit, transmits optic nerve (CN II) and ophthalmic artery. Superior orbital fissure: in sphenoid bone, connects middle cranial fossa with orbit, transmits superior ophthalmic vein and several nerves: oculomotor (CN III), trochlear (CN IV), lacrimal, frontal and nasociliary nerves arising from ophthalmic nerve (CN V1), abducens nerve (CN VI). Foramen rotundum: in sphenoid bone, connects middle cranial fossa with pterygopalatine fossa, transmits maxillary nerve (CN V2). Incisive foramen: in maxilla, leads to incisive canal that connects oral cavity with nasal cavity, transmits nasopalatine nerve (branch of CN V2), descending palatine artery. Greater palatine foramen: in palatine bone, connects oral cavity with pterygopalatine fossa, transmits greater palatine nerve, artery and vein. Foramen sphenopalatinum: formed between sphenoid and palatine bones, connects nasal cavity with pterygopalatine fossa, transmits nasopalatine nerve (branch of CN V2), superior posterior nasal branches of maxillary nerve (CN V2), sphenopalatine artery and vein. Lesser palatine foramina: located in hard palate (maxilla and palatine bones), connects oral cavity and pterygopalatine fossa, transmits lesser palatine nerves, arteries and veins. Inferior orbital fissure: formed by sphenoid and maxilla, connects orbit with pterygopalatine and infratemporal fossae, transmits infraorbital nerve (branch of maxillary nerve, CN V2), zygomatic nerve (branch of CN V2), orbital branches of pterygopalatine ganglion (originating from CN V2), inferior ophthalmic vein, tributary vein of pterygoid venous plexus, infraorbital artery and vein. Infraorbital foramen: located in maxilla, opens on external face, transmits infraorbital nerve, artery and vein. Foramen ovale: in sphenoid bone, connects middle cranial fossa with infratemporal fossa, transmits mandibular nerve (CN V3), lesser petrosal nerve, accessory meningeal artery, emissary vein connecting cavernous sinus with pterygoid plexus. Foramen spinosum: in sphenoid bone, connects middle cranial fossa with infratemporal fossa, transmits meningeal branch of mandibular nerve (CN V3), middle meningeal artery. Foramen lacerum: between sphenoid, apex of temporal bone and basilar part of occipital bone, connects middle cranial fossa with external cranial base, transmits nerve and artery of pterygoid canal, meningeal branch of ascending pharyngeal artery, occipital artery, emissary vein. Internal acoustic meatus: in temporal bone, connects posterior cranial fossa with inner ear, transmits facial nerve (CN VII), vestibulocochlear nerve (CN VIII), and labyrinthine artery. Jugular foramen: formed by petrous part of temporal bone and occipital bone, connects posterior cranial fossa with external cranial base, transmits glossopharyngeal nerve (CN IX, vagus nerve (CN X), accessory nerve (CN XI), internal jugular vein, inferior petrosal sinus, sigmoid sinus, and occipital artery. Hypoglossal canal: located in occipital bone, connects posterior cranial fossa with external cranial base, transmits hypoglossal nerve (CN XII). Foramen magnum: in occipital bone, connects posterior cranial fossa with external cranial base, rostral part of medulla oblongata with three meninges, ascending fibers of spinal root of accessory nerve (CN XI), anterior and posterior spinal arteries, vertebral arteries. Stylomastoid foramen: in temporal bone, connects posterior cranial fossa with external cranial base, transmits facial nerve (CN VII) and stylomastoid artery. The bones of the skull provide attachment for muscles of the head. The facial muscles arise from the bones of the facial skeleton, while the base of the skull has attachment sites for such muscles as the masticatory muscles, the extrinsic muscles of the tongue, the superior constrictor of the pharynx, and the muscles of the soft palate. The paranasal sinuses are extensions of the respiratory tract and they all open with apertures in walls of the nasal cavity. Functions of the paranasal sinuses include reducing the weight of the skull, humidifying inspired air, and aiding in voice resonance. The internal cranial base (latin: basis cranii interna) is bounded anteriorly by the parts of the frontal, sphenoid and ethmoid bones, laterally by the parietal and temporal bones, and posteriorly by the squamous part of the occipital bone. The internal cranial base contains the brain, the intracranial parts of cranial and spinal nerves, the meninges, blood vessels, as well as the cerebrospinal fluid. The internal cranial base is subdivided into three distinct regions or fossae - the anterior, middle and posterior cranial fossae. Each cranial fossa houses a different part of the brain. The anterior cranial fossa (latin: fossa cranii anterior) lies at the highest level of the internal cranial base and is formed by the cribriform plate of the ethmoid bone, the orbital plate of the frontal bone and the lesser wings of the sphenoid. Anteriorly and laterally, the anterior cranial fossa is bounded by the inner surface of the frontal bone. Posteriorly, it is bounded by the sphenoid bone - posteromedially by the anterior border of the prechiasmatic sulcus and posterolaterally by the lesser wings of the sphenoid. The anterior cranial fossa contains the frontal lobe of the cerebral cortex, the olfactory bulb and olfactory tract, and the orbital gyri. The middle cranial fossa (latin: fossa cranii media) lies deeper within the skull base and is wider than the anterior cranial fossa. The middle cranial fossa is formed by the body and greater wings of the sphenoid, the squamous part of the temporal bone, and the anterior surface of the petrous part of the temporal bone. The borders of the middle cranial fossa are formed anteriorly by the lesser wings and part of the body of the sphenoid, posteriorly by the superior borders of the petrous part of the temporal bone and the dorsum sellae of the sphenoid, laterally by the squamous parts of the temporal bones, the parietal bones, and the greater wings of the sphenoid. The middle cranial fossa of the skull accommodates the pituitary gland and the temporal lobes of the cerebral cortex. The posterior cranial fossa (latin: fossa cranii posterior) lies at the lowest level of the internal cranial base and is the largest of the three cranial fossae. It is formed by the occipital bone, the posterior surface of the petrosal part of the temporal bone, and the mastoid angle of the parietal bone. The posterior cranial fossa is bounded anteriorly by the dorsum sellae, the posterior aspects of the body of the sphenoid and of the basilar part of the occipital bone, posteriorly by the squamous part of the occipital bone; laterally by the petrous and mastoid parts of the temporal bone and by the lateral parts of the occipital bone. The brainstem and cerebellum lie within the posterior cranial fossa of the skull. The external cranial base (latin: basis cranii interna) is the outer aspect of the skull base that extends from the superior incisor teeth to the superior nuchal lines of the occipital bone. The external cranial base can be subdivided into an anterior, a middle, a posterior and two lateral parts. The anterior part of the external cranial base is made of the superior alveolar arch, the bony palate, and the choanae. The bony palate is formed by the palatine process of the maxillae anteriorly, horizontal plates of the palatine bones posteriorly, median palatine suture anteroposteriorly and the transverse palatine suture. Opening presented on the bony palate include the incisive foramen, as well as greater and lesser palatine foramina. The superior alveolar arch is formed by the alveolar processes of the maxillae and it contains the dental alveoli or sockets for the teeth. The choana is the paired posterior aperture of the nasal cavity that opens into the nasopharynx. The middle part of the cranial base is formed by the body of the sphenoid, the petrous parts of the temporal bones, and the basal part of the occipital bone or basiocciput. It extends from the choanae anteriorly to the anterior margin of the foramen magnum posteriorly. The middle part of the external cranial base presents with several openings, including the foramen lacerum, pterygopalatine fissure, foramen ovale, foramen spinosum, and the carotid canal. The posterior part of the external cranial base is mainly formed by the occipital bone. It features such opening as the single foramen magnum and paired jugular foramen, hypoglossal canal, condylar canal, as well as the small openings mastoid canaliculus and the canaliculus for the tympanic nerve. Each lateral part of the external cranial base consists of the zygomatic arch and the infratemporal fossa anteriorly, the mandibular fossa, the tympanic part of the temporal bone, and the styloid and mastoid processes posteriorly. The lateral parts of the external cranial base present such openings as the external acoustic meatus, petrotympanic fissure, stylomastoid foramen and other smaller apertures. The temporal fossa (latin: fossa temporalis) is a depressed area on each side of the skull that is bounded by the temporal lines and the zygomatic arch. The temporal fossa is located superiorly to the infratemporal fossa. The area known as the temporal fossa is bordered anteriorly by the frontal process of the zygomatic bone and the zygomatic process of the frontal bone, superiorly and posteriorly by both temporal lines (superior and inferior), inferiorly by the infratemporal crest on the greater wing of the sphenoid and the zygomatic arch, medially by the frontal, parietal, temporal and sphenoid bones, and, finally, laterally it is bounded by the temporal fascia. The temporal fossa contains the temporal muscle, as well as several nerves and blood vessels. The nerves found in this area include the zygomaticotemporal nerve, deep temporal nerves, and the temporal branch of the facial nerve. The deep temporal arteries, superficial temporal artery, superior temporal artery and their corresponding veins are also located in the temporal fossa. The infratemporal fossa (latin: fossa infratemporalis) is an irregularly shaped space situated on each side of the skull below the temporal fossa and deep to the ramus of the mandible. The infratemporal fossa communicates with the temporal fossa. Superiorly, the infratemporal fossa is bordered by the infratemporal surfaces of the temporal bone and the greater wing of the sphenoid, inferiorly by the medial pterygoid muscle, laterally by the medial surface of the ramus of the mandible, and medially by the lateral plate of the pterygoid process, the pharynx, and the tensor veli palatini and levator veli palatini muscles. Posteriorly, the infratemporal fossa is bounded by the carotid sheath. The infratemporal fossa serves as a passageway for several neurovascular structures that travel from the cranial cavity through the temporal fossa and infratemporal fossa to reach the pterygopalatine fossa. The neural structures include major branches of the mandibular nerve, chorda tympani arising from the facial nerve, and the otic ganglion, and the blood vessels crossing this region include the maxillary artery and the pterygoid venous plexus. The infratemporal fossa also contains several muscles of mastication - the medial and lateral pterygoids, as well as the tendon of the temporalis. Several openings found in the walls of the infratemporal fossa connects it with different areas of the cranial cavity, such as the foramen ovale, foramen spinosum, petrotympanic fissure, and pterygomaxillary fissure. These openings transmit particular nerves and blood vessels. The pterygopalatine fossa (latin: fossa pterygopalatina) is a cone-shaped, bilateral depression below the apex of the orbit on the lateral side of the skull, located between the maxilla, the sphenoid and the palatine bones. Different bony structures form the walls or borders of the pterygopalatine fossa. Anteriorly, the fossa is bordered by the superomedial part of the infratemporal surface of the maxilla; posteriorly by the root of the pterygoid process and the adjacent anterior surface of the greater wing of the sphenoid bone; inferiorly by the palatine bone, superiorly, it is opened with the inferior orbital fissure; medially it is bounded by the perpendicular plate of the palatine bone, as well as the orbital and sphenoidal processes of the palatine bone, and laterally it opens with the pterygomaxillary fissure. The pterygopalatine fossa accommodates the pterygopalatine ganglion, and it also serves as the passageway for the maxillary nerve, many of its branches, and the third part of the maxillary artery. The walls of the pterygopalatine fossa present several canals and foramina that connect the fossa with other regions of the skull like the orbit, nasal and oral cavities, middle cranial fossa, infratemporal fossa. And these openings transmit particular nerves and blood vessels. Openings seen in the pterygopalatine fossa include the sphenopalatine foramen, infraorbital fissure, pterygomaxillary fissure, greater palatine canal, foramen rotundum, pterygoid canal, and pharyngeal canal. The orbit (or orbital compartment, latin: orbita) is a paired skeletal cavity that is located in the skull on either side of the root of the nose. The orbit houses and protects the eye and its accessory structures. Anteriorly each orbit opens on the face with an approximately quadrangular shaped orbital opening. The bony orbital compartment has a roof, floor, lateral and medial walls surrounding the orbital cavity and its content. The roof of the orbit is formed anteriorly by the supraorbital margin that is a thin orbital plate of the frontal bone, and posteriorly by the orbital plate of the lesser wing of the sphenoid. The medial wall of the orbit is formed by the lacrimal bone anteriorly, orbital plate of the ethmoid bone medially, body of the sphenoid posteriorly, and inferiorly by the orbital plate of the maxilla. The lateral wall of the orbit is formed anteriorly by the frontal process of the zygomatic bone and posteriorly by the orbital surface of the greater wing of the sphenoid. The floor of the orbit is formed anteromedially by the orbital plate of the maxilla and anterolaterally by the orbital plate of the zygomatic bone. The orbits contain the eyeballs and their associated structures, such as nerves, blood vessels and extraocular muscles. Any space within the orbit that is not occupied with specific structures is filled with orbital fat that cushions the eyes and stabilises the extraocular muscles. There are several openings that connect the orbit with the cranial cavity and transmit nerves and blood vessels. These include the superior orbital fissure, inferior orbital fissure, optic canal, ethmoidal foramina, and the infraorbital canal. The nasal cavity (or cavity of nose, latin: cavum nasi, cavitas nasi) is an irregular, bilateral air-filled space located within the skull above the roof of the mouth forming the internal part of the nose. The nasal cavity serves as the initial part of the respiratory tract, it is lined with mucous membrane, which also houses olfactory receptors. The nasal cavity is a bony compartment that is split into two symmetric compartments by the nasal septum, and it has a roof, a floor and four walls that are all formed by bones of the skull. The roof of the nasal cavity is formed by the cribriform plate of the ethmoid and the anterior aspect of the body of the sphenoid. The floor is formed by the palatine processes of the maxillae. The medial wall of the nasal cavity is represented by the bony nasal septum, which is composed from the vomer and the perpendicular plate of the ethmoid. Each lateral wall of the nasal cavity is formed by the following structures: nasal surface of the maxilla, perpendicular plate of the palatine bone, ethmoidal labyrinth, lacrimal bone, medial plate of the pterygoid process of the sphenoid, inferior nasal concha. The anterior wall is formed by the nasal bones and opens with a pair of anterior nasal apertures. The posterior wall of the nasal cavity is formed by the anterior surface of the body of the sphenoid, and it presents a pair of openings called the choanae. There are three bony formations in each lateral wall of the nasal cavity that resemble curved shelves called the nasal conchae - superior, middle, and inferior. They project into the nasal cavity creating five pathways called meatuses. These are the superior, middle, inferior and common nasal meatuses, and the nasopharyngeal meatus. As other regions of the skull, the nasal cavity serves as a passageway for several nerves and blood vessels of the head, and thus it presents a lot of openings in its bony walls, such as the small openings of the cribriform plate, sphenopalatine foramen, incisive canal, and the opening of the nasolacrimal canal. The nasal cavity is also connected with the paranasal sinuses with openings to the frontal, maxillary and sphenoidal sinuses, as well as to the ethmoidal air cells.